Nutricanis dog food stands for not only great taste, but also the best selected ingredients. We want your dog to enjoy his food but also want to make sure he gets everything he needs with every meal to stay healthy and fit for longer. Therefore, for Nutricanis, “premium” means one thing primarily: high-quality ingredients that usually are not found in conventional dog food and that make a valuable contribution to an optimal diet for your dog. More and more dog owners are finding that their dogs are developing allergies or intolerances – for example to gluten-containing grains/cereals such as wheat or corn. Together with nutritional scientists and veterinarians, we therefore work on developing unique recipes that meet the needs of your dog with regard to health and wellbeing, based on current research. We want you to enjoy peace of mind when feeding your dog, safe in the knowledge that he is only eating ingredients that are good for him. And because they are so good for him, they taste good too: We use only selected types of meat such as chicken, turkey and duck, which as sources of essential animal proteins in our recipes – you will not find cheap slaughterhouse waste in our food. We also do not use grains/cereals such as wheat as fillers but instead provide your dog with nutritious vegetables such as potatoes and peas. Premium for us also means selecting herbs based on more than their flavour or their advertising effect. In our dog food, even the herbs serve only one purpose: to promote the health of your dog. Blueberries, seaweed, cleavers, nettle leaves, dandelion root, Egyptian chamomile, hawthorn leaves and flowers, juniper berries and aniseed contribute to the natural diet of a dog and contain vital minerals and trace elements that even carnivores need. 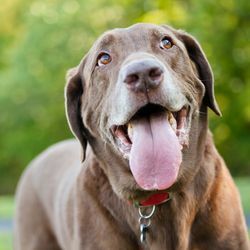 Our goal is to provide the best nourishment for every dog in any living situation and to take into consideration a variety of needs – from puppies to older dog, no matter what breed, whether overweight or not. By the way, one thing is a must for us: the clear declaration of our ingredients. This allows you to check at any time what you are feeding your dog and allows us to show you what we already know: that our dog food contains carefully selected, quality ingredients that provide species-appropriate and sensible nourishment for any dog.